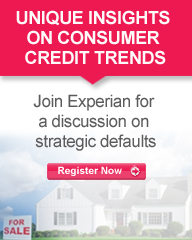 A recent Experian–Oliver Wyman strategic default study showed a significantly higher incidence of strategic defaults in California and Florida — both areas that suffered a high decline in home prices over the past few years. Strategic defaults in California were 32 times higher in the first two quarters of 2010 compared with 2005. Florida showed a similar trend, with strategic defaults 27 times higher in the first two quarters of 2010 compared with 2005.